Becky's Story . . .
Miss Becky is patiently waiting for a home that can accommodate her only special need……….that being a floor plan without steps to get in and out of the house. When nature calls she can be trusted to go outside by herself into an unfenced area. A quick squat and she’s done. Of course, she does like knowing that someone is watching from the door. In her foster home, there is one step into the house which she jumps up with a push off from her back legs. When it’s cold outside, her foster mom will give Becky a boost up that step to quicken the return to warmth. This suits Becky just fine too! 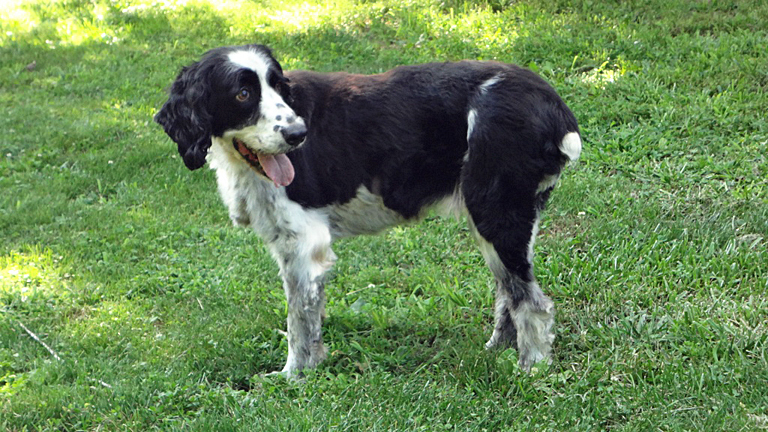 Many senior springers are quite spunky and Becky is no exception. Recently she was enjoying time on the deck and managed to slip part way off, between the flooring and railings. The other dogs in her home began barking an alarm as did Becky. She didn’t give up and slip to the ground but continued to bark to get help. In a flash her foster mom was out the door, giving Becky the boost she needed to get all 4 feet back under her and firmly on the deck. Oh, how we all love happy outcomes! Despite small hurdles, Becky manages to walk a mile a day and loves it. Walking up a little incline is slower for her; she walks behind her foster mom and the other dogs on the way home, but she does not stop and is determined to enjoy the outing. Indoors Becky naps and just wants to be loved. With 4 dogs in the house, she could be overlooked……not her! She comes to people in order to get attention and affection. She makes sure she is part of the family and does not miss out on activities. She is always under foot and loves to slip between one’s legs or stand right beside someone so she’s only finger-tips away from being petted. Becky is an incredibly sweet gal who needs limited care. She lives and enjoys life at the pace of a typical senior. Moderate physical activity brings her pleasure as well as a health benefit. She’s a people gal and is joyful in a home where she’s not marginalized for being “old.” The companionship she can bring to an adopting family is oh-so genuine. If you have a “step-less” entry and a soft spot for seniors, please email MAESSR’s adoption coordinator immediately. Becky could be walking through the holidays with your family! Becky found a loving, adopting family but it was necessary for her to return to foster care. Her new home had lots of stairs and Becky could not navigate them with her weak back legs. This made it very difficult for her to go out into the yard to do her business. For her safety, it was best for her to find a home with few stairs. In her new foster home Becky has just one step to use for getting in and out of the house, and she’s doing just fine. Her foster mom opens the door and Becky goes outside off lead to take a potty break. Even though she’s a little hard of hearing, Becky understands when it’s time to come back inside. Sometimes she gets a little help with the step when re-entering the house. Becky is building up her stamina and can now walk with the other dogs a mile each day. She is a little slow, but she loves to go outside with the other dogs. Good on leash, she does not miss a chance for a walk. Sometimes it is just a little walk around the cul de sac, but no matter; a walk is a walk! Becky loves attention and having her body massaged with a gentle rub. Being an older girl, she sleeps most of the day, but if something’s happening, she loves to watch. When there’s activity in the house she is always in the thick of things. 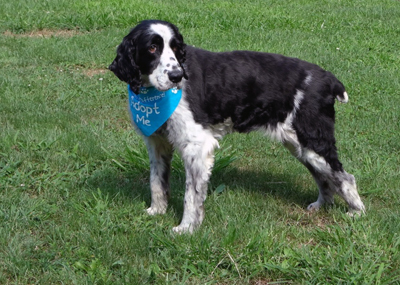 This sweet, loving senior wants to be close, in typical Velcro Springer fashion. When she arrived at her foster home, she was joined by another foster, an intact male. He took a fancy to Becky and would spend time licking her and getting particularly friendly with her, as intact males frequently do. She enjoyed some of the attention, but would let him know when it was time to leave her alone! This good girl is housetrained. She is able to be left for long periods of time alone in the house with the other dogs because she has wonderful house manners. When it’s time to sleep, she chooses one of the dog beds in the family room. Eating is high up on Becky’s list of “likes” and she will check out all the other dogs’ bowls to see if there is anything extra in theirs! When it’s time for treats, she patiently lines up with the other dogs, waiting for hers. Becky’s foster mom sums up Becky in just a few words: “She’s a great senior girl!” If you have a house with few stairs, consider adding this sweet girl to your family. Hey everyone……..from here in West Virginia, Becky is checking in with terrific news! This senior is doing so much better now that she is healthy once again. Her energy level is better and she can now go up and down the stairs in her home very easily and on her own. Her foster mom no longer has to help guide her for safety. Becky is stronger and much steadier on her feet these days and it shows. When her foster mom gets home from work, Becky shows her by trotting around the yard with the rest of the fur kids. Very much enjoying her new energy level and strength, it shows both in her pace and on her face! Her foster family has five other dogs in the house and Becky gets along beautifully with all. While one never asks a lady her age, Becky can tell you that she fits in well with her pack because most of them are “mature” dogs and their energy levels are very similar. There are several dog beds in the house and Becky likes them all. Since two of the dogs in the home are German Shepherds, the beds tend to be large and allow Becky to fully stretch out when she sleeps. When not sleeping, Becky likes to lay on one of them and watch her mom as she does her human stuff……….especially when she makes breakfast and dinner for everyone. That’s Becky’s favorite time of the day! Her appetite is in great shape now that she is healthy and she will eat just about anything that you put in front of her. Her foster mom groomed Becky recently and she loved this too. Her mom gave her a tub bath, some deep ear rubs and trimmed her feet and toenails. This appreciative gal loves it when she’s fussed over and made all pretty. Her coat just shines and is so soft…….woohoo! Her foster mom tells Becky that she is a pretty girl and Becky has to agree, especially after a spa treatment. Becky is now healthy and ready for a forever home. Her preference is for one that has at least one other dog, although she would be very happy to just receive all of the attention herself. Becky never turns away any attention and soaks it up like a sponge. Becky could offer companionship to a resident dog who is living solo and a little lonely. Or, she could devote all her time to people who know how good life can be with a senior Springer in it. She’s ready for a move……………let it be into your heart and home!!! Update 08/11/2013: "Becky’s rebound is at the heart of rescue." Becky continues to improve and get stronger. She saw her foster mom's regular vet and, much to everyone’s surprise, the vet could not hear Becky's reported heart murmur at all! The vet could only surmise that, when rescued and sick, Becky's cardiorespiratory status was quite compromised when compared to her present status. Great news for Becky!! With regular, wholesome meals, Becky has also gained two pounds. She is eating well and also surprised her foster mom recently by walking up four steps from the backyard to the porch. This is a first for Becky. Work will continue on walking up those steps now that she has the strength to begin. Her foster mom has taught her to go down stairs for safety and she does well with this. Overall, Becky is much sturdier than when she arrived in foster care. She’s gaining stability as she has gained strength and recovered from kennel cough. She is currently on two joint supplements to encourage further improvement. Her foster mom gave Becky a tub bath recently and she loved this, enjoying a full grooming session with blow dry, nail trim and ear cleaning. Becky's coat is luxuriously soft and fluffy and she just shines now. Becky’s rebound is at the heart of rescue. Don’t be surprised if this Mountaineer sets her sights on an adopting family soon! Original: "With her mobility challenges, Becky is a low energy Springer." Miss Becky is very lucky. While she has some health challenges, she is much stronger than when she first met her foster mom. 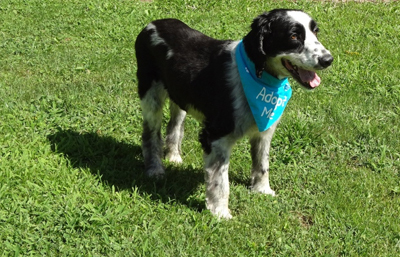 The two became acquainted in a shelter in West Virginia where Becky found safe haven after being picked up as a stray. When no one reclaimed her, she became a MAESSR girl. During her first days in foster care, Becky had little appetite and was battling kennel cough. Treatment began and, after many days, she was definitely feeling better. A Grade 4/6 heart murmur was detected at her vet check. Coupled with her weak hind legs, it is largely responsible for her lack of mobility. Initially, Becky could get up and out to the bathroom independently, but she did little more than walk in the yard, go to the bathroom and then return to a bed to lie down and nap. With appetite back, she inhales every bit of her softened kibble and licks the bowl with gusto! Woohoo!! With a full tummy and some time to rest up, Becky is more energetic. She’s trotting and bunny-hopping around her backyard with the other dogs now. Indoors, she surprised her foster mom by grabbing a rope toy from the doggie toy box and shaking it while running around the kitchen. What a great change to see! Perhaps Becky has lived in a home during her earlier life. She’s certainly displaying ease and good manners now. There have been no accidents. When crated, she whines or cries for a little while and then settles down quietly. She respects the baby gates she encounters in the home as well. With her mobility challenges, she does not jump up, counter-surf or get in the garbage. She is pretty happy to just lie on a bed in a corner, out of the mainstream traffic, and all the time watching what others are doing around her. She does have difficulty on slippery surfaces such as linoleum and tile, but does well with carpet. At night she sleeps on a dog bed. Becky appears to enjoy the company of other dogs in her home. She relaxes in their presence but doesn’t engage them in any play. She is fed separately in a kennel so no guarding has been observed whatsoever. She ignores cats. 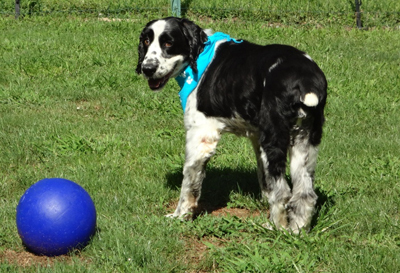 With her mobility challenges, Becky is a low energy Springer. She is not a dog that needs to be walked. Frequent trips to the backyard are just fine with her and then she will curl up on her bed once again. Becky is learning how to ride in the car in a crate. She whines for a little while and then settles down. Home grooming has presented no difficulties and is helping this senior to not only feel better but to look her best. Her foster home has been able to groom with clippers, and do her nails with a small power tool. Becky most enjoys have her ears cleaned with warmed cleaner solution. She knows that deep rubs at the base of her ears will follow! As time progresses, it is hoped that Becky’s cardiorespiratory and mobility challenges may stabilize. She shows great promise of being a loving companion for someone who is willing to just let her hang out and love her. More to come on this little senior……………..